"Shrek The Third" had been a financial success, but it wasn't as funny or Shrek-centered as the first two films. 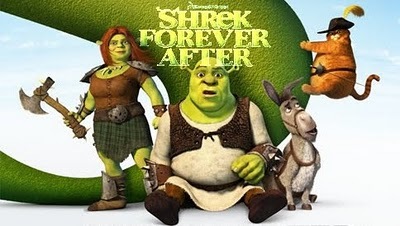 Mike Myers (Shrek) and his friendsd (Eddie Murphy as the Donkey, Cameron Diaz as Fiona, Antonio Banderas as Puss), however, were all set to go with "Shrek Forever After (2010). This one was directed by Mike Mitchell after Chris Miller left to do Puss in Boots. Once again, we get a change in tone, this one slightly for the better. The franchise definitely peaked with Shrek 2, but this is a nice send-off. The biggest change is that this film is in computer-animated 3D, so you will need the special glasses for this one. Fixing the major problem with the previous film, which went off track by focusing on other peoples' problems rather than Shrek's, this film sticks with the big green ogre and his own issues. Shrek wants to liven things up, as domestic life has gotten a little too cozy and he misses some of the old adventures that he, the Donkey and Puss in Boots used to go on and just "being an ogre." Rumpelstiltskin (Walt Dohrn), has the answer, and makes a deal with Shrek that winds up sending Shrek to an alternative-universe version of Far, Far Away. It turns out, though, that Rumpelstiltskin has a secret grudge against Shrek, who he thinks kept him from becoming king. 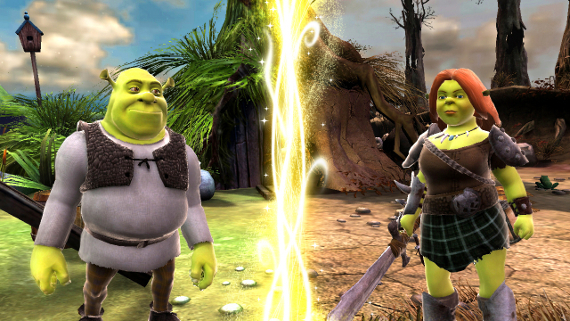 The alternate universe at first seems kind of fun, but then turns out to be a nightmare for Shrek. 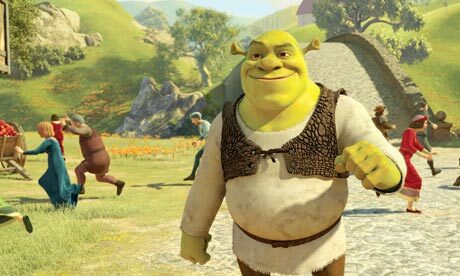 Ogres like him are hunted down and used as slaves, and Fiona is a wanted criminal. Rumpelstiltskin captures him and explains everything, with the startling conclusion that he is about to make Shrek disappear forever, as if he never existed. Even worse for Shrek's friends, by Shrek no longer being in his own universe, Rumpelstiltskin has changed that as well, so that he rules there, too. It appears that Rumpelstiltskin has outwitted Shrek and turned everything to his own advantage. Obviously, this is not what Shrek wants, so he escapes and tries to figure out a plan. He meets up with Donkey and they become friends again. Together, they find a loophole in the agreement with Rumpelstiltskin: if he and Fiona can get back together again, the contract will disappear and things will revert to normal. That has to happen quickly, for at the end of the day, Shrek will disappear. Fiona turns out to be a rebel who is trying to overthrow Rumpelstiltskin. Shrek puts the moves on her, aided by advice from Puss in Boots, but she initially resists. He finally begins to charm her, and eventually they kiss. It doesn't work because she doesn't really love him. After a raid on Rumpelstiltskin's castle goes wrong, Shrek and Fiona are captured.and it is up to Shrek's friends to help them escape from Rumpelstiltskin. The real task, however, remains: Shrek must convince Fiona to love him before he disappears at sunrise. "Shrek Forever After" places Shrek in peril, involves the audience more than placing someone else in peril, as in "Shrek The Third." It is a lot more fun than that film, but it still does not rise to the heights of the first two films. A problem that arises is that in the first two films, Shrek was establishing himself and changing the kingdom: here, he is just trying to maintain the status quo. That is inherently less interesting. While they did make a big deal about this being the final film in the "Shrek" series, that was only partially true. A "prequel" came out the following year, "Puss in Boots" (2011). Shrek and Donkey are not in that one, so technically it is not another "Shrek" film. It is a lot of fun, but a good Shrek story is better. 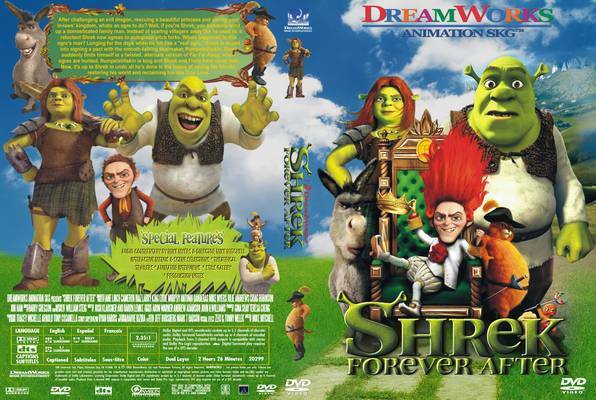 "Shrek Forever After" is a great film if you are invested in the characters and care about their relationships. Otherwise, it is a little difficult getting emotionally involved in whether or not Shrek can convince Fiona to kiss him and make it all better. 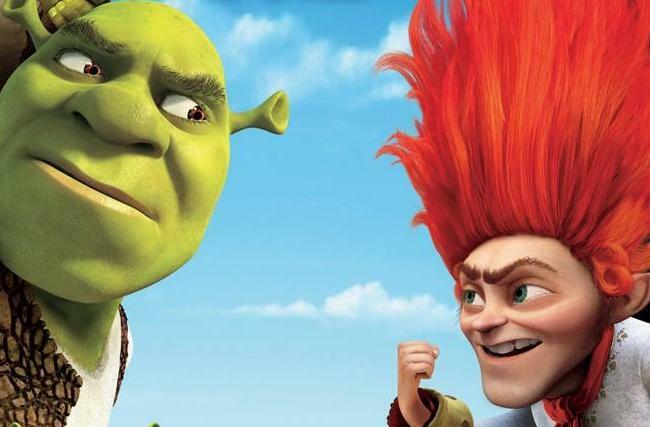 "Shrek Forever After" is a nice send-off for fans, but this probably is not a film you want to view without previously having watched and enjoyed the three previous films.